Baby owl flies far and wide over forest, river, mountains and back to nest. Each scene has a colorful, illustrated natural habitat. The author of this book wrote it at age 11. An engaging book, full of interesting facts: for example, it points out that the elf owl is so small it can perch on the end of a drinking straw. Jane Yolen, illus. John Schoenherr. Caldecott medal. A not-to-be-missed classic mentioned here before and will be again. A little girl goes owling with her Pa on a cold, clear winter night. 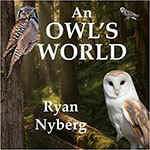 An exploration of the diversity, beauty and ecological importance of owls. Ms. Juliet hosts a monthly series called Wildlife Wednesdays at the Freeport Public Library. 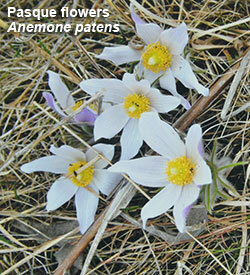 Each month has a different theme related to nature and wildlife. She will read various books related to the theme and then show the children specimens that they can touch. There are also activities that can be done at home to continue the learning! Oakdale Nature Preserve, 4433 S. Cranes Grove Rd. 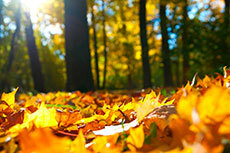 The autumn equinox is September 22. Let’s celebrate the first day of fall by being outside. We will take a hike around Oakdale and use nets and jars to collect insects along the way. Open to kids of all ages. Parents must be present with the children during the event. Kids should dress appropriately for the weather (long pants recommended) and should wear waterproof shoes or boots that can get wet in case we look for aquatic organisms. Signups are required. Contact leader Juliet Moderow at 201-233-0946 to register and/or if weather is questionable. Meet in the parking lot near the Mogle Center by 10:00 a.m. Hike will start promptly on time. “With its long, earlike tufts, intimidating yellow-eyed stare, and deep hooting voice, the Great Horned Owl is the quintessential owl of storybooks” (The Cornell Lab of Ornithology: All About Birds). This is one of our most common owls in North America and seems to be at home in lots of different places. 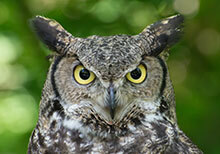 When clenched, the Great Horned Owls strong talons take a force of 28 pounds to open! Do you ever hear a large group of American crows making a big noise and cawing? Take a closer look; they might be trying to mob a Great Horned Owl. 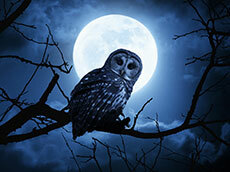 They know that the owl is a one of their most dangerous predators. They have lots and lots of very soft feathers which help to keep them warm in the winter but also to help them fly very quietly…almost no noise at all! The large eyes of this bird have pupils that open widely in the dark and retinas with many rod cells that help them to have wonderful night vision, when they like to hunt. They can swivel their heads more than 180 degrees to look in any direction. Can you do this? * Information adapted from Cornell Lab of Ornithology site All About Birds. Then go owling one night as the child and her Pa do. It’s worth breaking regular bedtime for one night – preferably on a night with no school the next day. Have a fall-themed party, independent of football and Halloween. Just enjoy. Search the yard and neighborhood for signs of fall; notice which trees have leaves that have begun to turn. Choose some leaves that are still completely green, some that are partly green and partly colored, some that may be all colored; make a collage with these, showing the increments by which the colors begin to dominate the green.